Do you live near Steinbach, Manitoba? Come to Pioneer Days at Mennonite Heritage Village, August 3-6, 2018. Enjoy a short dramatic presentation of a Mennonite migration story with TourMagination staff member Sandra Reimer on Friday at 3:00 pm or Saturday at 10:30 am or 3:00 pm. Experience a Mennonite migration story from Russia to Central Asia in the late 1800s through memories of Elizabeth Unruh Schultz. 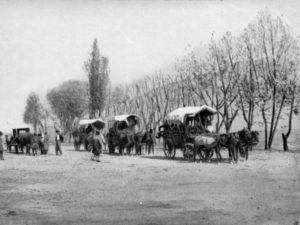 Elizabeth was 14 years old in 1880 when her family migrated to Central Asia with a caravan of 125 covered wagons to escape unrest in Russia. During the next 4 years Elizabeth travelled over mountains, through rushing rivers, and along rough roads. She survived life-threatening illness, raids by thieves, and escaped a deadly sandstorm. Through Elizabeth’s actual journal entries, woven into a fictional reflection, get a window into an exotic Mennonite migration story full of tragedy, triumph, and faith. 15-minute dramatic presentation followed by information about Mennonite Heritage tours in Poland, Uzbekistan, Ukraine, and Western Europe. TourMagination also offers a tour related to this incredible story. SEE DETAILS about the Central Asia: Crossroads of Faith & Culture Tour September 23 to October 4, 2019.